Antibody therapy has been proven to be highly powerful for cancer treatment. 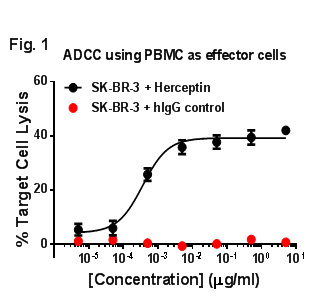 Two important mechanisms used by antibody drugs to kill targeted tumor cells are Antibody-Dependent Cell-Mediated Cytotoxicity (ADCC), and Complement Dependent Cytotoxicity (CDC). 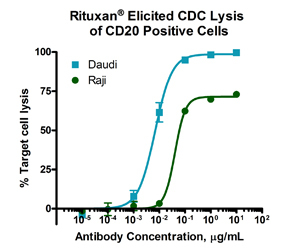 GenScript is pleased to present to you both a PBMC-based ADCC assay and natural kill cell-based ADCC assay. The readout is endpoint-driven (target cell lysis). 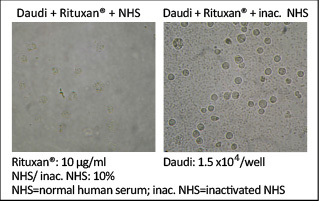 The CDC assay uses normal human serum as the source of complement. By implementing strict QC standards, GenScript can provide the assurance of the efficacy and potency profiles of your therapeutic antibodies. To save your cost and increase the speed of the experiments, GenScript offers complimentary target cells from a tumor cell panel. More information can be found in the link: /tumor_cell_lines.html. 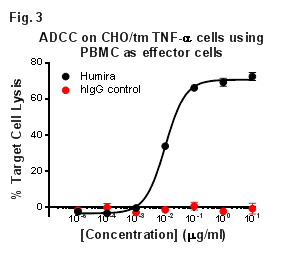 Figure 3 Concentration-dependent study of Humira-mediated ADCC on CHO/tm TNF-α cells by using PBMC as effector cells (human IgG as negative control). CHO/tm TNF-α was a cell line stably expressed membrane bound TNF-α at which the proteolytic cleavage site was modified. *All ADCC assays are performed in China. Please contact us mentioning "Discovery Biology", our customer service representatives are available 24 hours a day, Monday through Friday to assist you with Form preparation.